SB Nation editor and professional suit-wearer Jon Bois runs a regular series of columns titled Sports Cards for Insane People that peeks into baseball's cardboard excesses of the 1980s and 90s. 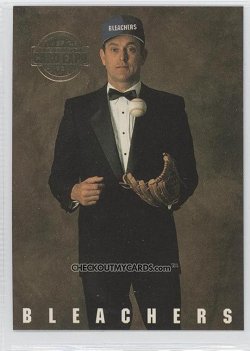 His most recent investigation plumbed the depths of Nolan Ryan oddballs and their casting call of plain blue hats, which featured two #5s. Look closely and cringe: card editors added "BLEACHERS" to Ryan's hat with cheap digital tools, just before they blew money on 23K gold foil. Must've been a crazy post-production session. Bleachers specialized in minor league cards, player-specific sets, and stamping gold foil on things. Lest they seem feckless and reckless, dozens of early 90s card makers competed in those same events. Don't know if any of them "won," but we lost. Jon proposes this is the first time any card featured a real skull. 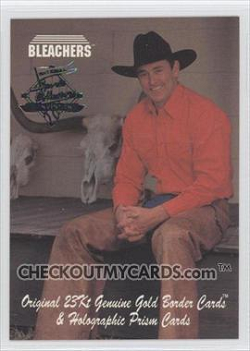 I also wondered: is Nolan the first to wear riding chaps in what's nominally a baseball set? Check out his article for maximal insanity.